When events or circumstances overwhelm me, emotion takes over and I can’t think – or rather I can’t stop thinking, but only in the most chaotic and unhelpful way. A long time ago I discovered that if I stop whatever else I’m doing and just look at something and draw, before too long I’m back in myself again and the chaos recedes. There is peace and sanity in drawing. I talk to them softly because at first they are edgy and two of them dart inside their drainpipe tunnel, but after a second they emerge again backwards, first their round little rumps, followed by sleek bodies and finally dark eyes, ears like crumpled petals, whiskers twitching. They watch me for a moment and then turn to nibbling carrots, and one of them comes to the water bowl near where I stand by the bars of the pen and climbs up to drink, balancing delicate front paws on the rim, raising an inquisitive nose in my direction, sniffing. There are maybe a dozen of them altogether – I don’t count – and their enclosure is long and narrow, with a partition at the far end where a small dark entrance leads to their shelter. I keep my eyes steady on first one and then another and hardly look at the page, just moving my pencil and looking. The late afternoon light is fading fast and a breeze has started to pick up. Suddenly, a gust of wind swirls round the garden, lifts a flurry of leaves on the path beside me and catches the calico bag I have slung on my shoulder. It rises and flaps in the air like a flag and instantly, in the blink of an eye, every guinea pig has vanished. I hear a scurrying, catch a glimpse of blurred motion, and that’s all. An empty pen. I’ve forgotten my irritation, my confusion, the pandemonium inside my head. I am as still, as quiet as the garden. Last year I came here with grief, at other times when I was depressed, and often I come just for the joy of it. It always works; they never fail me. What a beautiful reminder that there are a variety of ways to find peace. Loved your story and sketches of the precious ambassadors of peace. Thank you, Susan. You’ve shown me many different ways to find peace, too! Always good to hear from you. Have a peaceful and happy Christmas. We are so fond of guinea pigs too. My first birthday present to Nick after we were married was two guinea pigs. My mother in law thought I was crazy! Watching them or stroking them gave us that sanity and peace you found in drawing them – and your drawings are beautiful. Two guinea pigs, rather than two turtle doves, as a gift! I love it. A wonderfully loving present. lovely post! I have had Guinea Pigs in my family and they are sweet. Love your drawings! Thanks, and good to have discovered your blog – love your birds. Haha this was a very interesting read! I don’t recall being a great artist myself, but I think I will definitely give it a try when I just need my mind to wander off for a bit! Thanks for sharing! Give it a go, and enjoy! I know, our lives would be much poorer without them – sounds as if you have a wonderful family of animals! I never thought drawing guinea pigs could be so cathartic. Wow. Usually when I’m emotionally compromised, I find my outlet in a similar fashion. I make a bullet point list of the random things that aggravate me at that moment. The completion time of the list varies according to what’s going on at that time. After the list has been completed, I look it over and I chuckle at some of my entries. I once listed I was upset because a female coworker used her enormous breast as her armrest. I can’t believe that irked me!! I don’t even know why. Anyway, it was funny seeing it listed. Of course I highly recommend immediately destructing any list of things that irk you because you wouldn’t want that info to be read by anyone but yourself. I would’ve died if this chick read my entry. I may have to try the guinea pigs. I’m OCD so if I can’t draw an adequate guinea pig, I wonder will any other small critter be as effective? This is really funny. But obviously really effective! I think any small creature would work – though some perhaps better than others. Hope you give it a try! Hold it, big smile comin’ on…. Absolutely. Holding them’s even better than drawing. I love these drawings of guinea pigs. I see why you would want to draw them to change your mood. They are the most adorable animals. Thanks – adorable is the word. Your guinea pig drawings are cute btw. I think they sound as expressive as they look. Thanks! we have two little furry women currently munching their way through the Christmas veg peelings and I find watching them certainly makes my heart lighter especially when they are able to go out on the lawn and they immediately start to nibble as if someone has given them a time limit to eat all the grass. Pigs are the best, cute and cuddly, robust enough to live outdoors and the ultimate organic lawnmowers! Wow, I love the thought of guinea pig lawn mowers. There really is something unique about them, isn’t there? Glad yours enjoyed the Christmas veg peelings – sounds as if they really help out in your household! Thanks for re – blogging. I’m so glad you enjoyed the post. I love this post. I like to draw too. And when I draw, i become very imaginative so I usually draw to enjoy and have fun. Drawing can be a really great way to have fun. Hope you go on getting plenty of enjoyment from it. You said it – he-he indeed! Found you tonight, and it was a gift to see your drawings and read your comments. Thank you, for sharing all of it. Glad I wandered here. Our group of guinea pigs is long gone, but I was making guinea pig noises only yesterday as I remembered their chatter whenever the vegetable drawer in the fridge was opened! Oh, how I love the way they have stayed with you after such a long time! I had guinea pigs as pets as a child and remember them with great fondness. Hope the sound of their chatter never leaves you. Thanks for the compliment and so glad you enjoyed the post. They are cute, funny, little creatures, so I can understand how drawing them would put a smile on your face. Nice scetching. There’s nothing quite like them, is there? There are rabbits there as well in the same pen, and I like drawing them too but somehow the guinea pigs have a special quality all of their own. Thanks. Thanks for the re – blog! What happens if the guinea pigs you’re drawing start to get angry?? Interesting point. I’ve been thinking about this and I don’t know the answer! I would pick up on their energy, I’m sure of that, so probably my reaction would be to talk softly to them to calm us both down. They make a piercing shriek when alarmed, as well as dashing for cover, and the sound of that certainly gets your attention. Thanks for the question! Living without animals does make you feel incomplete, doesn’t it? I’m always having to find ways to fill the gap. Happily, animals themselves often seem to show up when I need them the most! Hope your life gets refilled with a pet or pets as soon as it’s possible. Yes your right when ever I walk past dogs with their people I always request a pat. You`re reminding me of what a psychologist once advised her listeners on a radio programme-getting involved intensely in a completely different activity for eight minutes or more can actually uplift one`s mood. Presumably there was some research done into the activity needing to be of eight minutes plus duration. The intensity of the activity must be important to get one`s mind of whatever was bothering it. It can be any activity-cutting hedges, digging holes, yes, even drawing guinea pigs-it just had to be completely absorbing. This is interesting. Certainly I find that absorbing myself fully and staying absolutely in the present moment is essential practice for wellbeing and peace of mind, but I didn’t know about the eight minutes. I’ll do some experiments! But I would say that the guinea pigs give me more than I’d get from digging a hole, I can be sure of that. They are definite my mind-focus of choice. Thanks for that insight! Greetings to you and Captain Rex. As an aside, has the Captain ever had a companion, or has he always been a bit of a loner? I understand they are highly sociable and tend to pine when solitary? Awwww, cute! I love Guinea pigs. They are so round and fluffy, and I like their sweet squeaky noises. They are so tame, and make great, loving pets, who are so cuddly and soft. I have had numerous guinea pigs throughout the years, and have one now. He always purrs when I pat him in a way he likes, and he likes to give me little kisses. I love my pig, and my pig loves me. I am like his parent! I never knew a guinea pig could purr. I’m learning such a lot about them from the replies to this post! Thanks for telling me about your wonderful little friend and companion. I have a special place like that too. Rather than to stop thinking, I use it to sort my thoughts out. It’s a swing in my balcony. I like to sit there and observe around midnight. Is it weird that I like thinking solo in the dark? Not at all! Sometimes we need to just relax, meditate, and think of our life objectively and then positively. This is only possible when we give ourselves time to think, contemplate and simplify all the complexities of our life! I like to think of you sitting at peace on your swing at dead of night. Solitary thinking (or just sitting and being, and not thinking) is something we probably all need to do a lot more of, and the night is a special time to do it. Absolutely not weird. Thanks. Thanks for this, and lovely to hear about your nightly untangling of thoughts on the swing! I replied to this a few moments ago and my reply has popped up further down the page, so my apologies to you and to anyone else for the confusion. Reblogged this on Arkansas Native Plant Society. With me it is a different animal but guinea pigs are a good relieve. One thing that relaxes is as good as another. The point is to have something. Would love to know what animal it is for you! I find different animals awaken different responses. Cats, for example, and horses, both of which I love, have completely different kinds of energy. You’re right, finding your own best way to relax is essential. But I do think there are different qualities of relaxation too, don’t you think? I also like to relax by simply walking, but this is not the same as the special kind of happiness I get from engaging with guinea pigs. Thanks, it’s good to hear from you. I love frogs. They jump and can croak at the same time. I am not so fond of toads cause they are warty. My relaxation is being with the wife over a thai dinner and pleasant conversation. Blogging tends to relax me since I do not think when I write. lol. Focusing on the here and now is what this is all about, most definitely. Will check out your blog as soon as I can – good luck with it, and with living in the present. As far as blogging is concerned, I’d say my best tip would be to read the WordPress Daily Post, do some of the daily and weekly challenges, and read all their posts and tutorials on the art and craft of blogging. They have really good helpful advice. Also check out The Community Pool. Good luck with your project and with your blog! This is a great post that demonstrates the a great technique of getting over challenges and pitfalls of our life. Invisible horse, great post! Thanks, and thanks for the reblog. It is so important to find something that brings you to a more peaceful place (even if only for a moment). I am glad you were freshly pressed. I’m always looking for new ways. Drawing works well for me, especially drawing animals and most especially, it seems, guinea pigs, but there are many many ways and as you say, the important thing is to find that place. And to remember to find time to do it! I’m glad you found my post through it being freshly pressed. Actually do you know, it’s not so much about talent as about the practice of doing it. Sometimes when I draw after a long break from drawing and I’m rusty, and make dreadful sketches, I’m afraid that I’ll find it just frustrating, but while I’m actually doing the drawing I’m completely absorbed and forget everything else. The trick is to look at what you’re drawing and hardly glance at the paper, and just not worry about what may be happening at the end of your pencil. Maybe you should try it! I have four of them and I love petting them, it’s so relaxing. Most of the time though, I just sit and look at them for a while. They’re great creatures. I had just the one, and she was terribly lonely, so I got her a friend. They are very funny together. Then we found out that Dolly, the first pig, was pregnant (she had been pregnant when we got her). She had four babies, so at one time we had six. Two of the babies were ‘lethals’ meaning they had a deadly gene, and they sadly died. But thankfully, the two surviving were both males so we put them both together (Coco and Stevie) and Dolly is with Emmy-Lou. A quick perusal of the Internet (and of course, the Internet is never wrong haha) has revealed that I have a ‘group’ of guinea pigs! Oh wow, thanks for that! A group. But that doesn’t sound good enough, or descriptive enough somehow, does it!? Love the story of your ‘group’. Yeah it’s quite underwhelming. I’ve always referred to mine as my ‘herd’! I think the collective noun for a group of guinea pigs should be a chuckle. Seems fitting, given mine make me smile, and they make a chuckling noise when content. They always make me smile, too. Thanks for joining in! Whenever I’m mad or upset, I just go for a walk or run with my head phones in. Although everybody has their way of dealing with feelings, and I’m glad you are able to find a healthy way to calm yourself. I like a brisk walk, (can’t run any more), but can’t get on with headphones. I seem to need to focus on just one thing at a time! Glad you have something that works well for you. There is a quiet simplicity to this post that quieted me as I read it. I did Ph.D. research on kids who draw as a way to make meaning in their lives. This post reminded me of them, and the importance of drawing in quieting life chaos. I’ll be back to your blog for sure. Such an interesting subject. Drawing certainly does this for me. Think I may be writing more about it and I’m grateful for your kind words. I’m so glad that reading it brought you a sense of quiet – I was trying to get across my own sense of peace and stillness and so I’m happy that for you at least, this came across. Such a hard thing to express! The more I stare at those pigs of guinea, the fuzzier I feel. Help me. Fuzzy as in good fuzzy, or bad? Hopefully good! Wishing you well. Funny how things can take you by surprise! Before I discovered these guinea pigs I had forgotten how engaging and lovely they are and once I started drawing them, it surprised me a bit as well. Glad to have given you a few moments to lose yourself with the little ambassadors of peace. Thanks. Your welcome 🙂 He’s like my baby! So sweet. Animals are so nice. They never think badly of you or judge you like humans. They are always there for you after a bad day at work. We could learn a thing or two from our fuzzy friends. I love drawing cats, by the way. They are such intelligent creatures. How fantastic to have guinea pigs so nearby. Your drawings are gorgeous! We live near a reservoir and every time I walk there (20 yrs and counting) it soothes and calms me. I find walking really calms me too, I feel I can’t somehow get my head straight without a short walk every day. I’m certainly lucky to have guinea pigs nearby (and a lovely, rather wild sort of a park) – you are lucky to have a reservoir! Our reservoir has ducks, swans, cormorants and otters…with eagles and red hawks overhead. We live barely 40 mins. north of NYC yet there is great wild beauty here. Mmmm so did I, a very long time ago – but I’ve never forgotten them, as you have never forgotten yours. I enjoyed this new perspective on escape? Do you own a Guinea Pig? Sadly, no. I’d like to, but I’d want to provide better accommodation than at present would be possible – I’d want really happy little pigs with plenty of space and amenities like the ones that I draw enjoy – so I have to make do with observing and drawing without being able to handle them. But then it is the practice of drawing, as well as the guinea pigs themselves that does it for me. 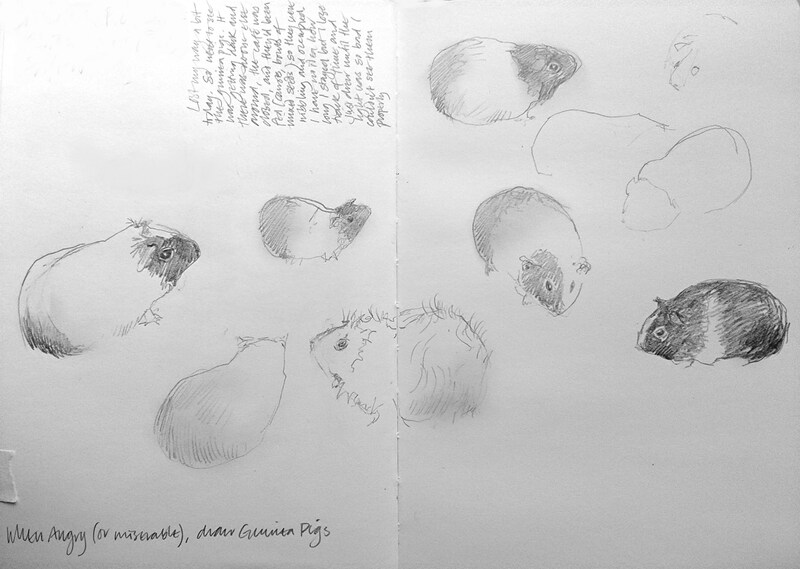 That’s my great escape – walking to the top of the park and spending time there with the guinea pigs and a sketchbook. Reblogged this on blogsmogfrog's Blog. Very good advice. Very good post. Thanks. It always works, doesn’t it? I don’t know where we’d be without animals in our lives. Glad to know your rabbit is as calming as the guinea pigs are for me. nice drawing of guinea pigs! Great post. Nice to see the real GP race get a mention. Matisse would turn in his grave should his beloved dove be replaced by a guinea pig as the emblem for world peace. You have really captured the beauty of drawing , well done. I suppose guinea pigs are not very emblematic, but if the comments here are anything to go by they certainly do an awful lot of peace work, wherever they are – probably more than doves! I don’t think they figure much in art, either as symbols or just as themselves, which is surprising really, and a pity! Oh they really are, aren’t they? Glad you think so too. Thanks, and greetings to you and the two piggy bosses. Furry bundles of joy is just what they are. Gosh.. so similar! I draw caricatures of the people who made me angry.. helps, in a comical way! That’s interesting, I’ve never tried that. A good way of venting! Its always good to find a way to see the funny side of things (and people) as well. Thanks for that. I know, sometimes I’m lost for words, too. Sometimes words aren’t enough, are they! Wow, I’ve never tried that. Not sure it would work for me. But whatever works for you! Thanks for dropping by. nice.. loved reading your idea… your drawings are cool too. Thanks, glad you liked both the writing and the drawings. Good luck with your blogging. Thanks. I wonder if you can also post some of your drawings as just a small media post. I am sure, the blogger community would like it a lot. Thanks for the suggestion….I’ll think about it. Reblogged this on patricelegoute's Blog. is that your guinea pic sketches? wow, you’re a great illustrator! i love little & cute furry animals. their looks and movements just make me smile regardless how piss off i am at the moment. but i’m just not a gifted illustrator, unfortunately…. Thanks for the compliment on my sketches but really drawing is just an extension of looking, so if you’re already looking a lot and really focusing, you’re half way there. All you need is a lot of practice! Very interesting read. It’s intrigues me how you wrote your story, and how you find peace. Drawing seems a lot more peaceful than trashing a room and curling up in a ball, I’ll be sure to keep that in mind. Your drawings are really good, too. Guinea pigs, the mascots of peace? I never knew. That day I needed a fast walk uphill in the cold air first, which could be the equivalent of trashing a room I suppose, before I could settle down and start drawing. So you could say you need both! But I really recommend drawing, as a way to focus and forget everything else. Especially drawing animals. An interesting perspective on finding peace, and very nice relevant picture. Lovely that you have such happy memories of them! Eeeek! I hear guinea pigs everywhere noting your avaricious idea with alarm! I bet Jaffa is irresistible. Good to hear from you. I love that you told me the exact number of Brussels sprouts. Of course I love that the horse is called Dapple-grey, and what I love the most is that Jaffa gets a ride now and then. Would it be asking too much for a post, with pictures? Thank you – glad you found it interesting. Fantastic concept. I think I may just have to grab my pencil and sketchbook and give this a go. I could definitely use a little peace right now. Oh do give it a try. Just looked up your recent post and I can see you have a lot to deal with right now. My very best wishes for your peace and wellbeing, and I hope you will find stillness and happiness again soon. Thank you, you’re very kind. Happy blogging, I look forward to your next post. I own guinea pigs and your description of them is so well observed! Glad to hear that from one who obviously observes them on a daily basis! They are such lovely creatures to watch. Thanks. Thanks for the invitation. Will do! Do give it a go. It’s the focusing that does it, but the guinea pigs make it So much better! I recently moved to Lima Peru with my family. Guinea pig (cuy) is a delicacy here, and we often visit a restaurant in the country where the menu item (dozens of guinea pigs) live in their pens in the back, behind the restaurant. Your blog gave me new perspective on these gentle creatures, besides being animals waiting for their number (or order) to be called. Next time, I’m taking a pad and pencil so I can do some drawing. I have plenty of anger I’d like to get rid of. Thank you for the wonderful post! Oh dear, I was afraid someone was going to tell me this. I did know of course that guinea pigs are a food item in Peru and as I am not a vegetarian I realise I have to accept this, but I would find it terribly hard to eat a guinea pig now. I become very connected with whatever I draw, so if I’m going to go on eating meat I’d better stay away from drawing chickens, and fish, and sheep and cows…..! Seriously though, do try drawing them. And let me know if you still feel happy about eating them afterwards! I suppose we also have to thank the Peruvians for their tradition of keeping guinea pigs this way which in turn introduced them to us, as pets. Ah well. Oh, I’ve never eaten one……and probably never will. Just can’t bear to do it, especially after looking them in the eyes. I’ll stick to drawing them, for now. I’ve haven’t been giving my guinea pigs as much attention since I got a puppy. You’ve made me realise what an impact they can and do have on our lives. I must get them out for a play today! Easily overlooked, aren’t they? A puppy can’t be ignored. But they have such a calming energy, in a way quite a good balance to hold when you’ve got such a demanding and exciting relationship going on with a puppy (which can be rather exhausting). Perhaps both you and the puppy will find them a calming influence, you never know! I was riled up from reading comments on another post when I came across yours, and it had such a calming effect on me. Your writing is very vivid and poetic. Also, your guinea pigs are adorable; they remind me of when I briefly took care of two. Wow, I’m so glad my writing calmed you down, I feel humbled and grateful for that. I’d love to feel that I may have passed on some of the peace and calmness that these little creatures seem to arouse. It seems they really are ambassadors of peace. Thanks. And hope you have a peaceful and truly happy New Year. This is an interesting idea! You are really blessed to live on a land with such adoring creatures. Back in urbanised cities, skyscrapers do not usually make for such a great drawing experience. They say that artists’ and painters’ happiness lie between pencil/brush strokes. I believe it. 🙂 Great drawings too! Keep up the great effort and enthusiasm! I am indeed blessed that I can visit these guinea pigs whenever I want to. I can understand what you mean about skyscrapers. But the urban landscape is in fact not barren of creatures you know! Although it’s much more of a challenge I find drawing people brings a very strong sense of connection and focus and is calming, too – though you may find it surprising that I’ve found the same thing with drawing a snail. And then there are pets, like dogs and cats, and birds, which somehow seem to manage to live alongside us in cities. So there may be more opportunities than you realise! Thanks for joining in the discussion. Yes, portraits have always fascinated me, although most of my practices materialise in photography. I am not really gifted in drawing and sketches, nor canvas painting or charcoal drawings, but I find a certain sense of delight in photography, specifically in areas of composition and image editing. Nevertheless, your drawings of guinea pigs really fascinates me, and your comments make me enthusiastic about embarking on a journey of self-discovery through art drawings. I really like to thank you for that. In my city, I see many cats and dogs more than other animals but that should be enough to get me started on drawing. But I will probably start with some still life first, maybe a flower or a fruit, just to get the drawing basics right. Looking forward to more of your drawings. This is absolutely amazing! I used to have guinea pigs and me and my family always thought that they knew something more than they were letting on. What a lovely subject matter. Oh my goodness, maybe they did. The more you pay attention to animals the more you realise they have understanding and skills that we totally underestimate and mostly ignore. I’m learning more every day. Good to have heard from you! I know, sometimes I don’t know what to say either. I wish I had a guinea pig…and could draw…and had anger to get of, because then I’d give this a try. By the look of things, you love cats, and they are wonderful creatures to draw, to say nothing of being great comforters too. Probably why you responded to the guinea pigs. Thanks for joining in and good luck with your blog. Thanks Jessie! So glad you enjoyed it. Makes me miss mine! Lovely sketches they’re too cute. Oh dear, sorry to make you homesick for your pigs. But also lovely that this reminded you of them with love. Thanks! What a lovely post to read as a new blogger. Thanks, and welcome to WordPress amd blogging. Good luck with all that you write! Wonderful post! I will draw one today! Oh that’s great! Hope you enjoy drawing them as much as I do! Just stumbled on your blog, but nice drawings! Thanks, good to hear from you and glad you liked the drawings. You are certainly good at drawing them – hope this doesn’t mean you have a lot of practice! Um, well, I have to admit that I have had quite a bit of practice, yes. But that’s what drawing takes! The more you do it the better it works. Like anything else really. What is more soothing then guinea pig drawing? Absolutely. And thanks for the reblog! I started taking beginner drawing and colored pencil classes at my local art center a couple years ago and could not believe how therapeutic it was to just sit and get lost in drawing (however remedial or unskilled you may be) for a few hours. Absolutely love this post. Completely agree. What I find interesting is how drawing animals takes the therapeutic nature of the thing to a whole new level. I’m so glad you enjoyed the post! Glad you enjoyed it. It had to be shared! Drawing is a release. Thank you for the reminder. I have been angry too much lately. Glad you found it helpful. Good luck with the drawing, and hope you find it dispels negative emotions as I do! Thanks for reblogging. My daughter has two “ambassadors.” I hadn’t thought to draw them; but, holding and watching is always calming as long as they nibble carrots and not me. Love your sketches and wise words. Do they really sometimes nibble you?! I’m sure they must mean it lovingly…..I’m learning such a lot about guinea pigs. I always have my sketchbook at my side, just in case I need to record something. I can relate. Glad to meet another sketchbook user! Thanks, and glad it struck a chord. These are so cute. I can see how they’d have a calming effect; they’ve definitely made me smile 🙂 Beautiful work! Glad they made you smile. If that comes across from my drawings then the little ambassadors are really doing their job! Thanks. Sketchbooks and guinea pigs definitely go together. Glad you enjoyed it. I’m so glad you enjoyed it. In fact it was a lovely thing to write. Thanks so much. So good your guinea pigs bring you such a lot of happiness. Actually this is not so much an escape, as a way to focus and engage, which is kind of the opposite, isn’t it? Good luck with your writing – hope it will become all you want it to be. Yes, you’re right, of course. Good point. In a sense it is an escape. But rather than an escape, I use it as a way to reconnect to the calmest part of myself, so that the anger or anxiety or sadness or whatever I’m afflicted with is dispelled and I can see things for what they really are, and not be so troubled by them. There’s a diffence, I think. I remembered the guinea pig my parents bought me when I was seven. I actually had to get sick before they bought me one. Guinea pigs bring me memories of my childhood years. and I calms my soul. Its amazing, isnt it, that just thinking about them is calming? On days when I can’t get to see them I do just that. Thanks. Glad you enjoyed the post, and my drawings. Always good to hear from those who like to draw! Nice flower sketch. I’m so glad you liked the post. I’m still not sure exactly what it is about observing animals that is such a powerful experience, but I do know it has a lot to do with connecting to their wordless energy, and to engage in this same wordless way. A difficult thing to describe! Guinea Pigs are the sweetest, most curious little creatures. We had a pair once who looked like little old ladies. All they needed was a row of pearls and a little knitted cardigan. Their look of perpetual shock led to their names, Maud and Audrey. Puppies are good! Whatever it takes. So glad you liked it, and thanks for your thanks! Exercising to some degree and drawing are both wonderful ways to relieve the stress of life. Years ago I was very depressed and nothing seemed to be able to break me out of it. Then one day I spent some time with my 6 year old nephew and finger painted a canvas with him. It was an absurd thing by the end of it, but the result doesn’t matter. . the action does. Another way to relieve my mind is to create an image and write a poem about it. Lovely story about the finger painting. I think this is also about how doing things playfully is also really, really important and tremendously helpful. Also agree about creating an image and writing a poem – very powerful way to focus and calm the frantic mind. I love the idea of you feeling like a guinea pig reading this. Probably the nicest compliment you could have paid. Thank you! These are just wonderful as is your narrative. My guppies do for me what the guineas do for you… I have a tank at home and one at work. A wonderful calm blankets me when I sit in front of the tank and just look… Thanks for sharing! So glad ypu have animal companions who do this for you. Wonderful, isn’t it? Thanks! Your blog gave me a sense of calm in a frenetic morning. Thank you. I needed it myself, today! Glad it helped. I’m more of a hamster person, myself. 😉 Actually, I wanted to say that I really liked the illustration at the top. Glad to have a hamster lover on board! They’re lovely too. And thanks for the compliment on the drawings. Thank God i stumbled upon this piece. I was having a bad day and somehow this reminded me that venting out can make me feel a lot better. Thanks! I’m so glad it helped, and hope you’re feeling better. It can be such a sense of relief to find a way to let go! Best wishes. Thanks – being Freshly Pressed has been overwhelming; I’m only just managing to keep up with all the comments and new followers, and I’m discovering lots of wonderful blogs in the process. Do try sketching guinea pigs, they are such endearing creatures and I’m sure you’ll find yourself loving them as I do! Thanks for this. Great blog, great attitude. Oh what kind words – thanks, and I’m so glad you liked what you found here! “I am as still, as quiet as the garden. ” – Beautifully written. I enjoyed it. Thankyou. Thanks for such a lovely, appreciate comment. I’m really glad you enjoyed it. My brother goes for long bike rides and takes his sketch book with him in order to relax. Nature, whether guinea pigs or trees, is always great to enjoy in order to get away for a little while. Always great to hear of someone who goes about with a sketchbook instead of a phone camera – or perhaps as well as. There’s nothing quite like it! As you say, nature is a great restorative. “A long time ago I discovered that if I stop whatever else I’m doing and just look at something and draw, before too long I’m back in myself again and the chaos recedes. There is peace and sanity in drawing.” ~So important to, as “Dapplegrey” recommends, take your attention away from the problem and put it on “the solution.” Whether that means meditation or exercise or friends or creativity or quiet time in nature, “changing the channel” allows for an emotional shift to a better present moment. Wonderful article. Enjoy. Thanks for your appreciative words, and for the reblog. I really like “changing the channel allows for an emotional shift to a better present moment”. Good to have you join in! Cute post! I got two of them myself and they’re the cutest things ever! They have the nicest, largest and roundest buttocks. And when I take them they start licking my face and hands and they “popcorn”, cutest little animals! They’re wonderful. Nothing quite like them! Loved your story. There really is somthing very special about guinea pigs, and I can see why your daughter Amber is so devoted to Squeaker. They are very sociable little animals and happier in pairs or small groups. Have you thought about getting a companion for your little pig? Thanks for your reply, yes, we are talking about getting another girl piggy for Squeaker. So happy to hear that! Both Amber and Squeaker will be delighted.